In this season of summer and elections, the mercury, as well as poll fervour, have gone up in western Rajasthan — a region that will witness a historic battle between chief minister Ashok Gehlot's son and BJP president Amit Shah's trusted man. 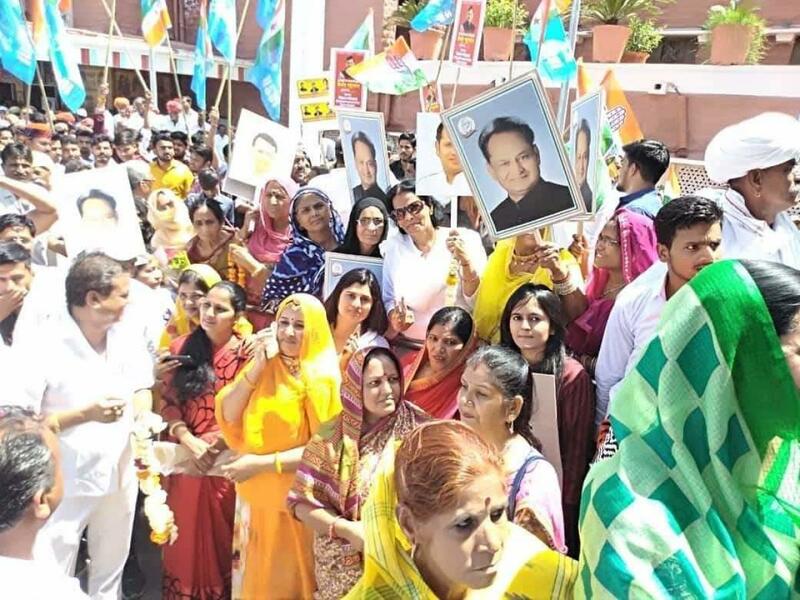 Vaibhav Gehlot (39), who has been fielded as the Congress candidate against the BJP's Gajendra Singh Shekhawat (51) from the Jodhpur Lok Sabha constituency, arrived on Monday morning to kick off his maiden poll campaign. He reached Jodhpur via intercity train and received a huge welcome at the stations of Pali, Phulera, Kuchaman etc. Even before junior Gehlot could reach his home turf, his rival Gajendra Singh Shekhawat, Union minister and MP from Jodhpur, accused Chief Minister Ashok Gehlot of preparing the ground for his son in the first 100 days of Congress rule in the state. "In first 100 days, Chief Minister Ashok Gehlot just focused on preparing the political ground for his son Vaibhav instead of doing work for the state,” Shekhawat said. He further held the Congress responsible for deaths due to swine flu, farmers deaths due to loan burden, rising communal tension, undeclared power cuts, water crisis and financial mismanagement. With Vaibhav's entry into active politics, the high voltage drama has commenced in Jodhpur, often called the politically active city of Rajasthan. But while BJP candidate Shekhawat, also known as the trusted man of PM Modi and Shah, started his campaign two weeks ago, Vaibhav reached Jodhpur only on Monday. Ashok Gehlot's popularity in Jodhpur may help Vaibhav in his maiden poll battle. However, Shekhawat, who is contesting for a second consecutive time having defeated Congress' Chandresh Kumari by a whopping margin of over 4.10 lakh votes in the previous election, is a tough competitor. The Jodhpur parliamentary seat, which will go to polls in the first phase, has 19,34,194 voters with 1,980 polling booths. In the recent Assembly elections, the BJP had lost six out of eight constituencies while the remaining two seats had been won by the party with a very low margin.